Here's something novel. A set of memo pads that look like sushi. It looks really cool, but beyond that there isn't a whole lot going on. These are memo pads, not note pads. 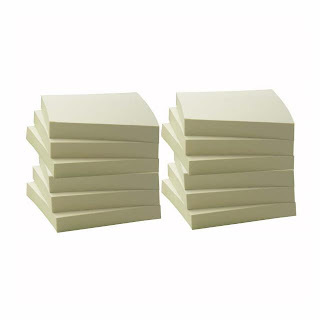 Office Supply insiders know that memo pads are just bound with glue on one edge, but note pads are bound with a strip of adhesive along each piece. So note pads are exactly like 3M's Post-Its while memo pads are those pads of paper that are handed out at conventions and end up in junk drawers. 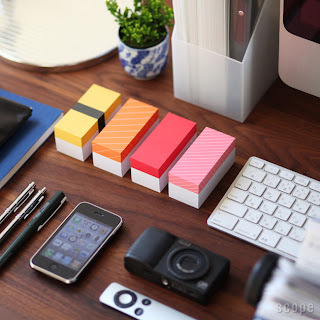 The "in action" photo shows exactly who they are trying to sell these memo pads to, people who don't use their desk, but just look at it. He's got a Rolodex right in front of the keyboard, and there's no way anybody should keep something that size between their body and their keyboard if they are planning on using it regularly. Who honestly would attempt to keep a phone, hipster camera, expensive pens, and computer remote all perfectly aligned and square. That just looks foolish. After you've used the top of the memo pad and gotten down to just pieces of white paper it wouldn't be special any more so you'd have to throw it out. Notice how approximately 2/3 of the pad is white. Smart marketing, you would have to buy new paper 3 times as fast as if you had purchased some standard economical memo pads. It is earth week though so really I shouldn't be telling you about products that encourage waste just to make more profit. Here's a great way to save the earth, some cash, and your sanity. Some great 100% recycled note pads from Sparco. Sure these aren't Post-it brand recycled notepads, you'd pay a premium for those, I did say I was going to save you some cash didn't I? As for saving your sanity, well these are adhesive backed notes. The sushi notes don't have any adhesive so after you write yourself a note and rip it off the block you will promptly lose it. With some adhesive you've got a better chance that it will stick to something and you'll remember it when you need it. Some people might prefer the flash of a fancy memo pad, but I'll stick (get it) with a good old reliable note pad.